‘Green’ or ‘sustainable’ building practices preserve and protect the environment. These include resource conservation, energy efficiency, use of sustainable materials, and minimal waste and pollution. McCutcheon also focuses on “Healthy Building” – processes, design features and materials selections that protect the health of our clients and their families during construction as well as after the completion of the project. 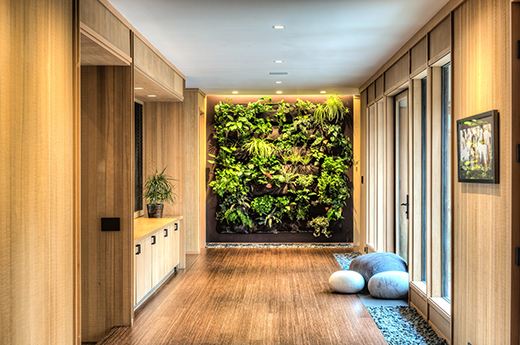 We integrate green and healthy practices into every phase of design and construction. In addition, we assist clients in navigating advanced green and healthy options, to incorporate the features that best meet their needs and lifestyle. Green building practices encompass a wide range, but all relate to the preservation of the environment and resources. Our construction practices include many green aspects which don’t impact cost, schedule or project aesthetic or quality. Our field staff are trained as Certified Green Building Professionals, and our standard practices include use of building supplies made from locally sourced, recycled or sustainable materials, job site recycling and conservation, and careful handling of waste and pollutants in order to protect the neighborhood. In this way, we can minimize the environmental impact for every project. Of course, ‘Green Building’ measures can also extend far beyond these simple but important measures. New processes and technology present options for materials and systems that are on the cutting edge. We have been privileged to work with clients who are motivated to build state-of-the-art solutions, which can present challenges and yield learning opportunities that can further advance the Green Building field. Some of the systems that we have worked with include ‘passive house’, rainwater and greywater systems, solar thermal, photovoltaic, hydrogen fuel cell, net-zero energy buildings and green building certifications (LEED Platinum and Green Point Rating). What shade of green is best for you? Most projects don’t involve these advanced green options. Our goal is to help our clients realize their vision of their project, and we use our practical experience with these green systems to help select the best green features for each design and client. Remodeling is inherently green since it conserves resources and extends the useful and fulfilling life of existing structures. When our clients renovate their homes to fit their needs and taste, it ensures that the home will endure and provide pleasure for many more years to come. McCutcheon also incorporates best green principles of conservation and recycling into our business practices at our office and warehouses. We have received awards and recognition for our leadership from the San Francisco Business Times, Alameda County, and EBMUD, and our office net-zero energy facility, powered by the sun. We have also lead the building community in developing green practices. 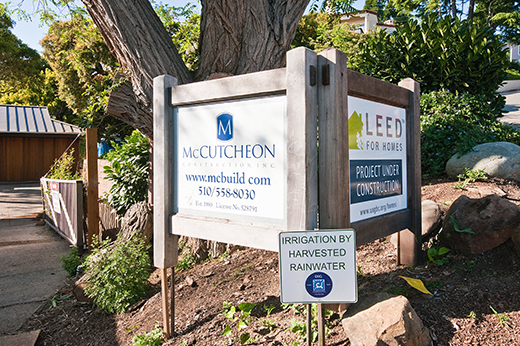 Michael McCutcheon was a founding member and past President of Build It Green, the premier Green Building organization in California, and was instrumental in developing the Certified Green Building Training program. At McCutcheon, we also focus on ‘healthy’ building to support the health, safety and comfort of the people affected by the project: our clients, their families, as well as the neighbors. Similar to our green practices, we have incorporated basic ‘healthy’ practices which don’t impact cost, schedule or project aesthetic or quality. At the outset, our staff is sensitive to the health and safety needs of each client, including children and pets. It is vitally important to take any measures needed to ensure that all of our clients are safeguarded during the construction process. Our standard work flow for remodeling begins with rigorous protection of the home, including protective barriers and, as needed, negative pressure ventilation. Clients often live in their homes during construction, so it is important to protect the living spaces from pollution and debris, and also protect surfaces, belongings and landscape from accidental damage. During construction, our daily practice includes job site cleanup. This ensures the safety of the jobsite when our staff is not present, and also keeps debris and disruption under control. If hazardous materials are disturbed during construction, such as lead paint or asbestos, we take special care to prevent contamination. McCutcheon is an EPA Lead Safe Certified company, and we engage proven professional abatement firms as needed. Finally, one of the most important skills for any project is expert waterproofing. Not only does this protect the building and the internal structure from degradation, but it prevents moisture that can lead to mold, which is a significant health hazard. Proper waterproofing is surprisingly complicated, so our staff takes specialized training to ensure that we provide the best waterproofing in any situation. Any construction project affects the neighborhood, so we take proactive steps to avoid and minimize the impact on neighbors. Some projects, such as condominium renovation, require careful coordination with neighbors regarding working hours and impact on communal space. Before the start of any project, we send a letter to the immediate neighbors to inform them of the upcoming project, and to provide our direct contact information so they can contact us directly as soon as any questions or concerns arise. During construction, we are careful to clean up on a daily basis. This can be especially important if heavy construction is underway (such as excavation), to prevent mud and debris along the street, or toxic runoff into storm drains. Finally, our staff is careful to avoid parking congestion or hazardous or annoying debris that can upset neighbors. Our goal is to preempt problems– and we find that neighbors are appreciative. "Thank you for your letter re: the project next door. I think of it each day as progress in our neighborhood. I want to thank McCutcheon for its consideration especially with respect to parking across the street instead in front of our house. Your efforts mean a lot to us." Using our experience and knowledge of the latest trends and developments, we present appropriate healthy options whenever they fit our client’s plans. These measures range from basic concepts such as Indoor Air Quality (ventilation, nontoxic materials, mold avoidance), to high tech concepts (such as RF or EMF shielding), to ancient building traditions (such as Feng Shui or Vaastu Shastra). We work to understand and apply any aspect of building that will assist our clients in realizing their most comfortable and healthy home.